MOBA players hate lag of any sort and NVIDIA set out to make GeForce GTX 950 the best GPU for MOBA gamers by tackling latency. 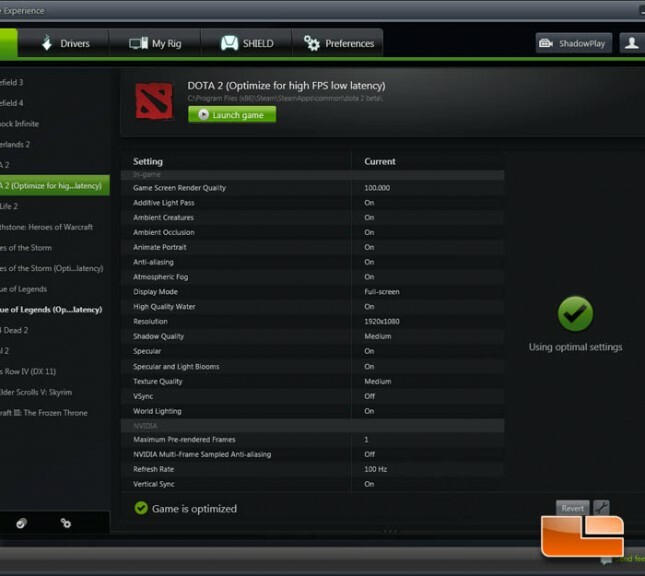 Their internal testing with the GTX 650 and Dota 2 showed that the amount of time it took for a mouse click to appear on the monitor as an on-screen action was 80ms. That’s actually quite high as it’s not uncommon for Dota 2 or League of Legends players to complain about 90ms network latency. 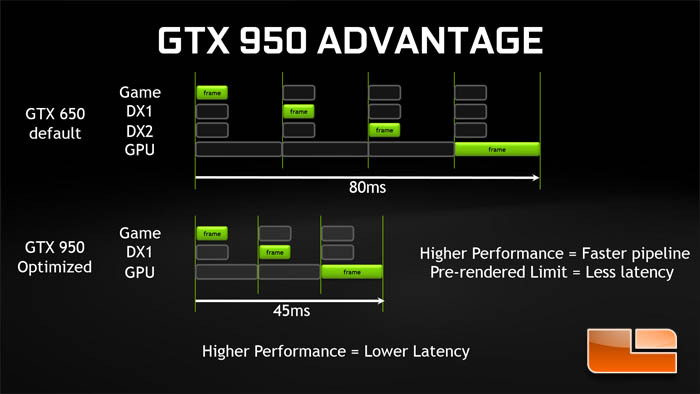 Improvements to GTX 950 response times come from a combination of Maxwell’s faster graphics rendering and reducing the number of pre-rendered frames. The result is a 45ms response time between mouse click to the on-screen action outputted by GTX 950. 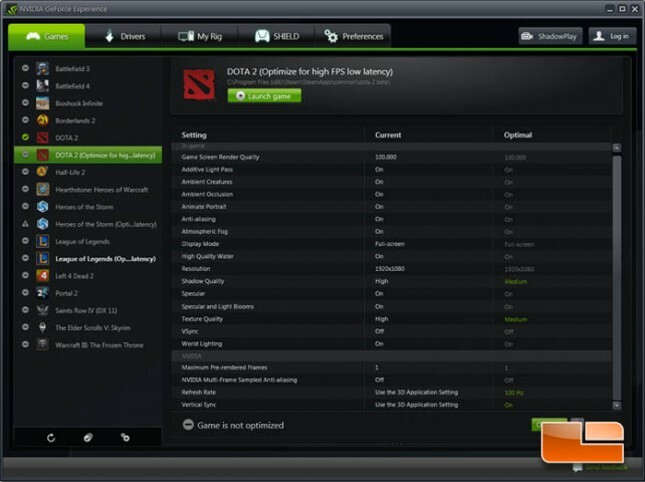 That’s a 35ms reduction from the 80ms experienced with the GTX 650. A video demonstration of that internal testing with a high-speed camera is shown below. The faster Maxwell renderer normally sees its benefit with high refresh rate monitors, though the shorter time needed to pre-render a frame is being leveraged to reduce video output latency. Normally, the driver buffers two pre-rendered frames which are represented in the illustration below as DX1 and DX2. 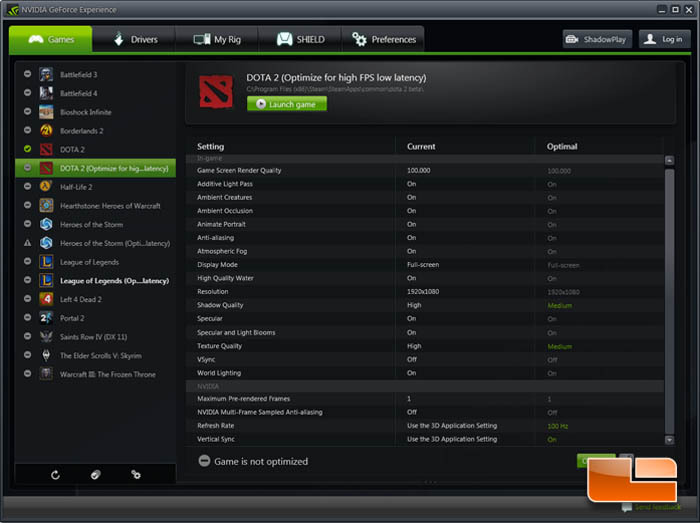 Maxwell can reduce the number of pre-rendered frames waiting to be displayed on the screen to just one. The combination of Maxwell’s faster renderer and reduced frame buffer reduces the graphics latency by nearly 50%. 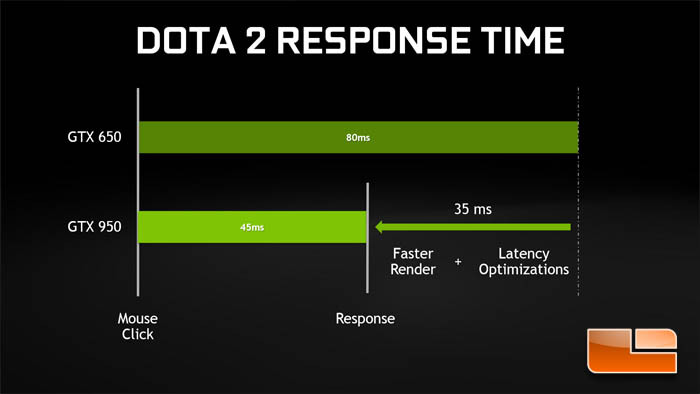 The GeForce Experience team at NVIDIA made it easy to enable these optimizations at the press of a button. 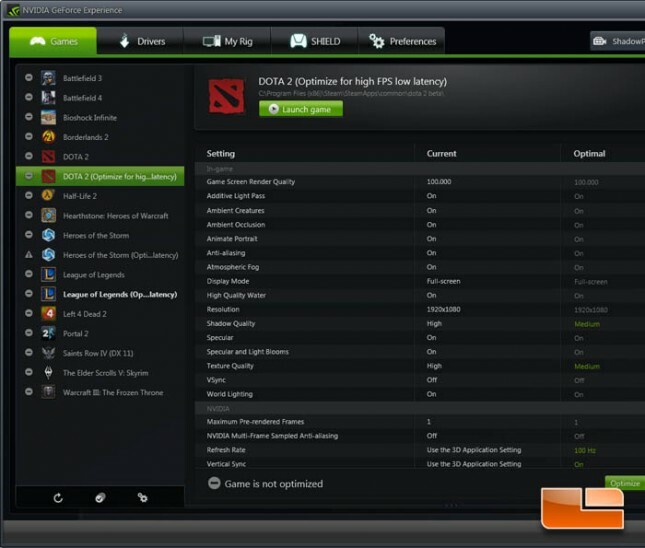 New High FPS Low Latency presets for Dota 2, League of Legends, and Heroes of the Storm in GeForce Experience have become available. Pressing the Optimize button overwrites game and drivers settings so that the low latency optimization is fully applied by the next time the game is launched.